Your precious patio area is a private place in your house that is meant for friends and family to enjoy the warm weather, and have a lazy lunch while chatting over the weekend happenings. You may also wish to have your patio around your backyard pool to be used as the party area where all can breathe in free air while enjoying nature. Each home has a unique patio, and yours is suited to your lifestyle. You may wish to build a roof over it to provide you the right shade or protection from rain on a lazy weekend holiday. To build a patio roof, you will have to take some technical points into considerations too. Firstly, if you are planning to build one over a concrete roof, make sure that the concrete slab can bear the weight of the structure as well as the pressure of the wind and the rain. It is best that you consult the building engineers for the purpose. Once you have the clearance from the techies, you can proceed to choose a patio roof design from the numerous available ones, and customize it according to your size and requirements. If you are choosing patio roof designs for an area that is detached from your main structure, you can try a design that will stand out against the main structure. The use of a high flyover type of patio roof will be one such that will rise high and stand out against the building facade. These fly-over types of roof will generally be flat like that of a flyover. A free standing patio, on the other hand, can be made into a gable roof with any kind of embellishment on top, such as glass windows in between the roof structure. A gable roof can also be made high like that of a flyover to allow for creating the extra height space to permit ventilation of hot air. In case you are looking for an easy to install and quick patio space cover design, you can also opt for the attached skillion roof. It will extend your outdoor living area effective by providing protection form the harshness of the sun and the rain too. Gable gateway type of roof designs is a great idea when you wish to create a patio on one side away from the main structure. 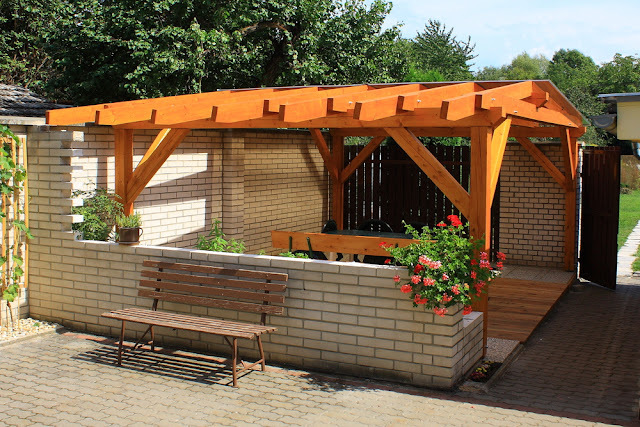 Since the main purpose of building a patio roof is to create a protected place that will give you free air along with the shade, it is best to keep the roof high enough for all practical purposes. Since you may also choose to cook under this patio roof, you will need enough open space for the smoke to escape, so as not to choke you on the air while you are dining. In case you want natural light not to be obstructed due to your roof, opt for wooden framed roofs – flat or gable that will fit glass as the primary cover. Apart from the classy wooden finish it will also complete the natural landscape. However you may wish to design your patio roof, you will find insulated patio roof made out of steel and in modular designs that you can use to fit into your patio space. You can use these insulated modular roofs to design straight roof line or gable patio roof designs too complementing the outer landscape of your building structure. This kind of roofing material will also give you the facility to inlay your wiring for lights and fan, as per your need on your patio roof. The other advantage of constructing any kind of designed roof with this material is that it will involve low maintenance costs too. Let’s have a look for more designs and details about patio roof.